A sign Wednesday at Discovery Space. StateCollege.com photo. A wetlands exhibit at Discovery Space. StateCollege.com photo. 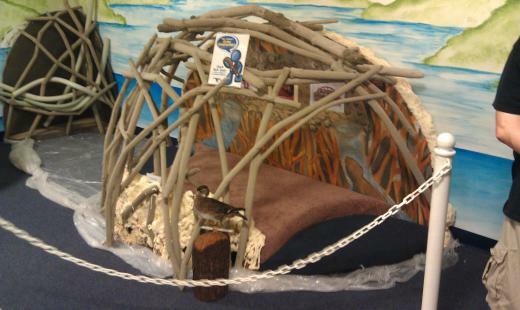 A beaver-hut exhibit in progress at Discovery Space. StateCollege.com photo. 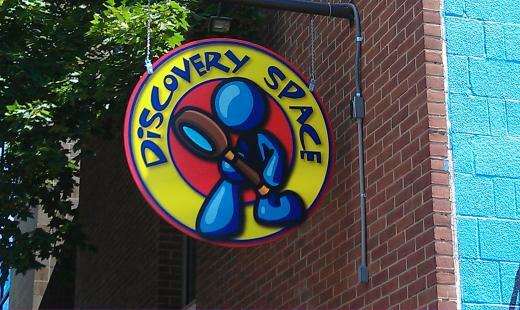 A new sign outside Discovery Space. StateCollege.com photo. 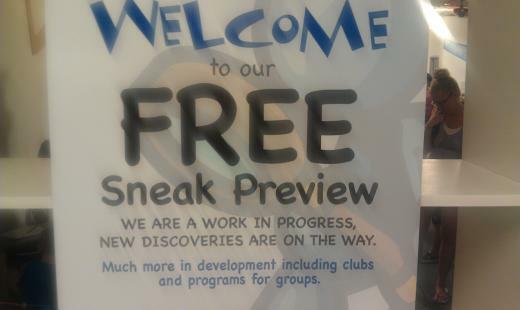 Hundreds of visitors poured Wednesday into the Discovery Space of Central Pennsylvania, taking advantage of a free sneak-preview event that will run through Sunday. Wednesday marked the public's first chance to see inside the emerging, hands-on science museum, geared toward children and youth. Some 600 people walked through the doors in the first 90 minutes; within the first three hours, more than 1,300 had shown up, museum tallies showed. "I haven't had one (piece of) negative feedback," assistant museum director Ellen Holleran said. Instead, she said, a familiar refrain among observers was that "I can't believe someone hasn't done this before." "It has been a really good reception," Holleran said. The opening was timed to coincide with the 45th annual Central Pennsylvania Festival of the Arts, which kicked off Wednesday with Children and Youth Day. Nearly a half-dozen exhibits, plus a variety of other activities, are set up inside the 4,000-square-foot museum at 112 W. Foster Ave., State College. Together, they represent about 40 percent of the attractions that will be set up there when the nonprofit museum is complete in the fall, Executive Director Art Heim said. He said a portion of the exhibits will change often as a matter of course. Features in place now include a simulated beaver hut, still under construction; an archaeology exhibit where kids can dig in sand for artifacts; several meteorology-related features, including a simulated TV studio; and a wetlands simulation. 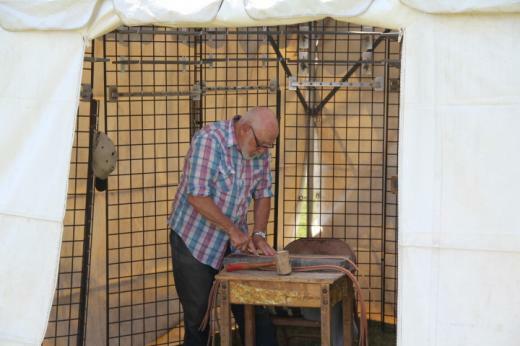 Other items include hands-on electrical-circuit demonstrations and shadow puppetry. At least a dozen Discovery Space volunteers were on hand Wednesday to help visitors navigate the new space. One was Sam Tybout, 18, of State College, who said he's interested in science himself. Plus, "I was just looking for something to do this summer," Tybout said. Growing up in State College, he said, he went to Pittsburgh to visit the Carnegie Science Center. He's glad to see something in a similar vein open in the Centre Region, Tybout said. The museum space is airy and bright, with an exposed ceiling and a scenic, rural-themed mural painted on one wall. The floor is mostly carpeted with short blue and gray fibers. They soaked up a few stray water droplets from the wetlands simulation, where National Weather Surface surface hydrologist Charles Ross was conducting demonstrations early Wednesday afternoon. He said the weather service is letting Discovery Space use NWS simulation equipment for public-education purposes. AccuWeather.com, based in Ferguson Township, has contributed to the museum's natural-science efforts, as well. 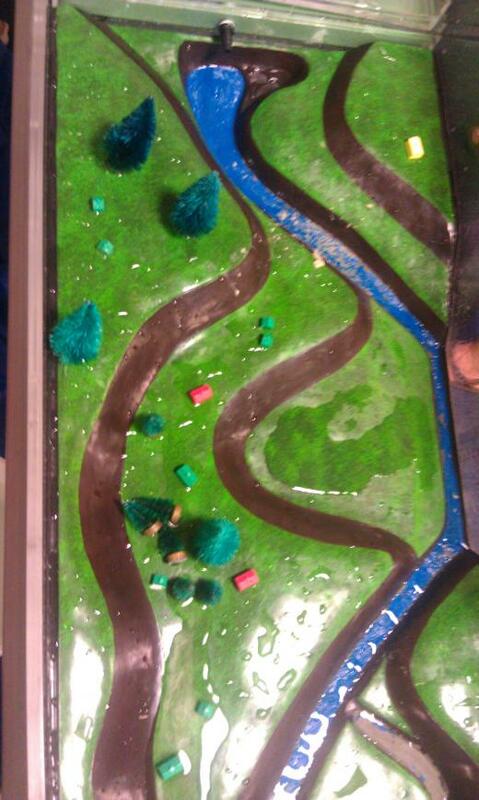 For its part, the wetlands simulation, with a model landscape, shows visitors how stormwater flows differently onto pervious and impervious surfaces. "We want it to be an educational tool," Ross said. "It has much more use here than it does sitting in our office." Discovery Space plans to remain open -- free of charge -- from 10 a.m. through 5 p.m. until Sunday, the last day of the arts festival. After that, and for the rest of the summer, the museum plans to be open Wednesday through Sunday for the rest of the summer. The admission price will be $3 apiece after the festival. That price will jump to $6 closer to the fall, when Discovery Space plans to have its full complement of exhibits in place. Memberships are available, as well. Heim said the operation will be financially sustainable -- as long as it has financial support that goes beyond the money collected at the admission box. Discovery Space organizers have sought a combination of public and private philanthropic support to help underwrite the effort. The museum's annual budget -- between $300,000 and $400,000 -- is tempered in large measure by the volunteer support the endeavor has received. Some 400 people have signed up to give time to the museum in one way or another. Ernest Brown was there at the beginning.